Historically as interest rates have risen, equities have done well. As illustrated in this post, since 1971, the S&P 500 (TR) has gained about 20% on average in rising rate periods, has gained 8 of 9 times and has gained nearly 40% twice with less than a 4% loss for its worst rising rate period. Also shown in the same note is that every sector, size and style rise on average with rising interest rates, though small caps do particularly well. This is since growth and inflation are taken into account in many cases when measuring equity duration, where if the growth and inflation outpace the discount rate (based on the interest rate,) the impact is likely positive for stocks. 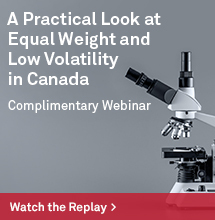 Given the relatively strong performance of small caps with rising rates, inflation, GDP growth and the falling dollar, now is an interesting time to examine the alternative weighting index performance from the market capitalization weighted indices. Market cap weighted indices by design, are meant to measure the most basic beta, or systematic risk of the market. In other words, they just reflect the market composition, so bigger companies get bigger weights resulting in less exposure to smaller companies. While those indices represent the markets well, the resulting risk and return may or may not be suitable for particular investment goals. 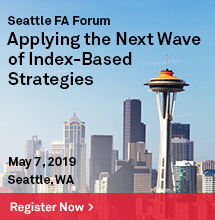 One of the oldest and most common solutions is to include more of the small cap premium by equally weighting each stock in the index, and as shown in this post, equally weighted indices work well historically on average. Another way to adjust weights is by style, commonly split by value and growth. Although there are indices that only include style specific stocks many of them still weight the stocks by market cap; however, weighting the stocks by style is more potent, especially for large caps. So, equally weighted large caps at the core with large cap pure style weighted indices, both growth and value, can give more of performance usually generated by a separate small cap allocation. Source: S&P Dow Jones Indices. 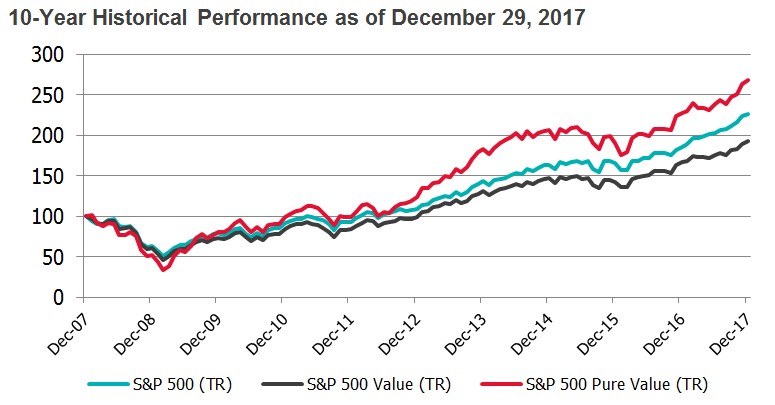 Monthly total returns from December 31, 2007 to December 29, 2017. 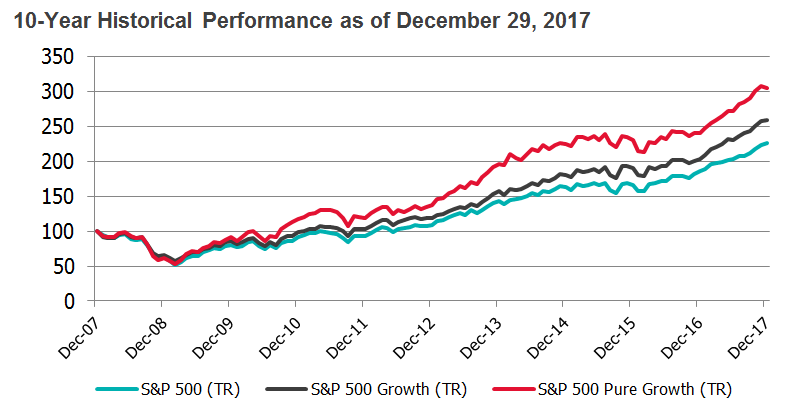 The S&P 500 Pure Growth outperforms largely due to its over-weights in financials and health care and under-weights in technology. Similarly, the S&P 500 Pure Value outperforms from its over-weights in financials and consumer discretionary at the expense of technology in addition to energy, industrials and materials. The S&P MidCap 400 Pure Growth also adds alpha, particularly with a falling dollar, since the index is more heavily weighted towards information technology. This mid-cap sector benefits most from the weaker dollar due to more international growth prospects than in any other sector. 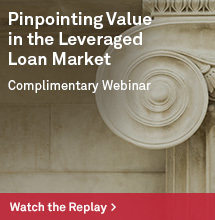 While the pure growth and equal weights mostly outperformed across sizes, the pure value outperformance only held in large caps. This is since much more of the weight is redistributed across the large cap spectrum than in the mid and small cap range. Source: S&P Dow Jones Indices, LLC. As of close of business Mar. 8, 2018. 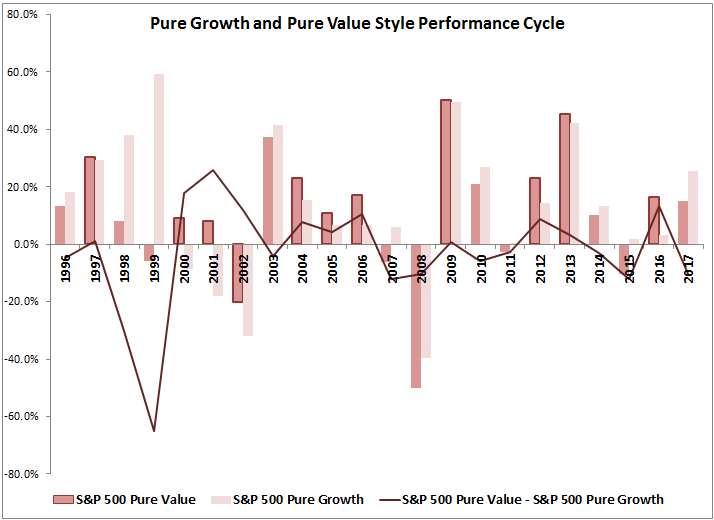 Although the pure styles have provided outperformance particularly in large caps, the returns between the styles cycle, just like in the size cycle. Source: S&P Dow Jones Indices, LLC. As of close of business Dec. 29, 2017. 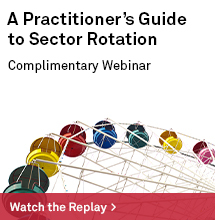 Wherever one may believe the cycle is, one thing that is clear is that in periods of rising rates, large caps benefit most from an alternative weight like equally weighted or pure style, and given longer term size and style premiums exist, these may be strong core choices. 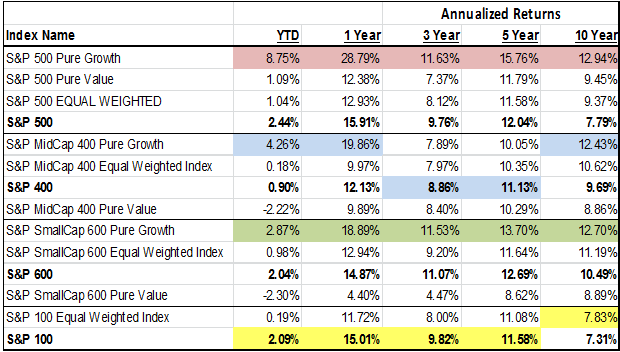 For every 100 basis point rise historically, the S&P 500 has risen on average 1.5%, whereas the S&P 500 Equal Weight rose 4.7% and the Pure Styles of Value and Growth rose a respective 6.1% and 7.9%. 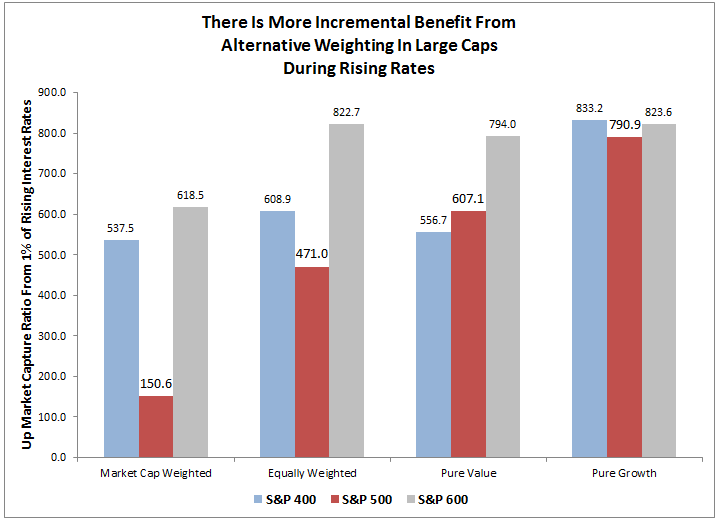 While the small caps still outperform in rising rates, the best bang for the buck from alternative weights is in large caps.